In our series on Manuscript Studies, Mildred Budny reports on items in the Illustrated Handlist, among other specimens. Usually those items have some evidence, internal and/or contextual, which enable or imply the identifications of their places or regions of origin, the original manuscripts to which the dispersed fragment belongs, and/or their routes of transmission to the current owner. Various of our blogposts in the series prove these possibilities. Not in this case. Here we focus on a fragment of a tiny Book of Hours which strayed into the group without any record of its provenance. We illustrate this fragment as an opportunity for recognition among its peers. The scale of this leaf leaf comes into perspective when set among some of its companions in the Handlist. As in the set of Group Portraits, front and back. The Leaf had its debut among our Manuscript Groupies. 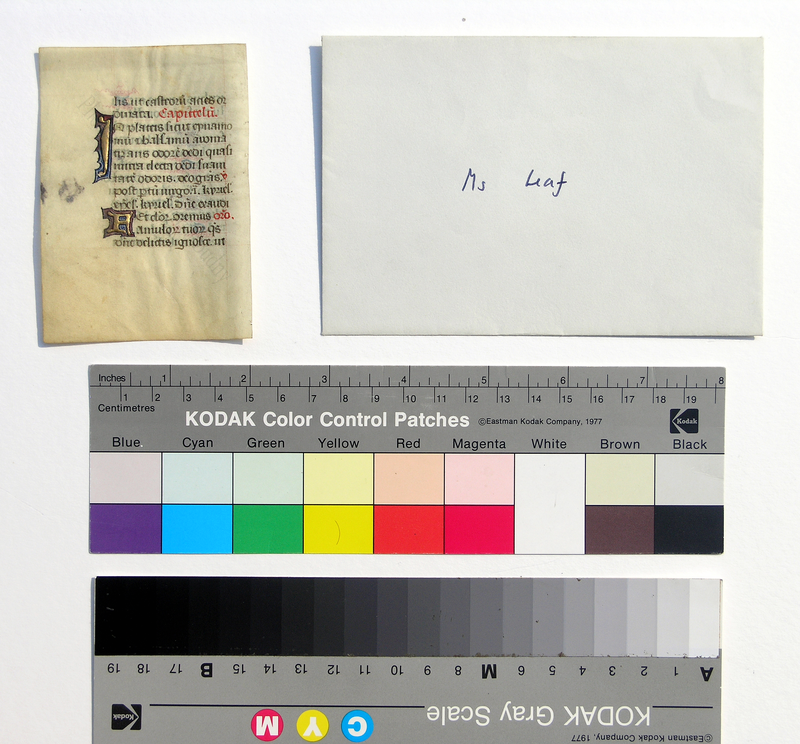 Within those collective Photo Opportunities, Views 1 and 2, this Leaf appears at bottom right, respectively with its Verso and Recto. Tiny, right? A lovely shape to clasp in the hand. The original manuscript must have been a joy to hold and to behold. 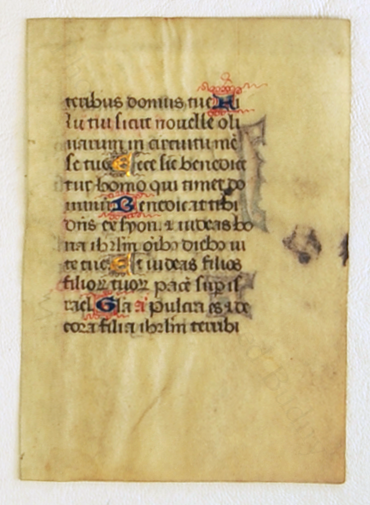 The thin Leaf turns its yellowed hairside of the animal skin toward the recto, and the whitish fleshside to the verso. 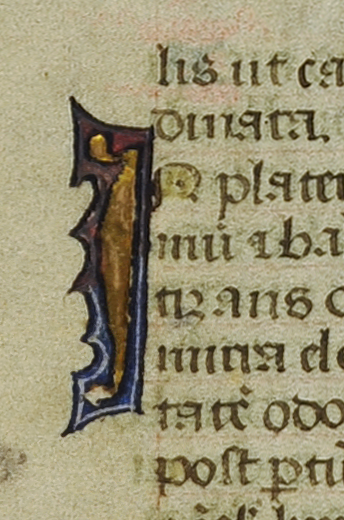 An unevenly undulating cut severed the leaf from its former conjoint stub or, more probably, conjoint leaf of a bifolium, with some traces remaining along the inner margin of marks for the former stitching of the volume. The marks of dirt accumulated along the upper, lower, and outer edges attest to a period of storage as a closed volume. The smudged, darkened stain aligned about midway down the outer edge probably derives from contact with a metal clasp oxidized over time. Such a closure would have helped to embrace firmly a small, fat volume of the sort which a full Book of Hours in such a compact layout would have required. 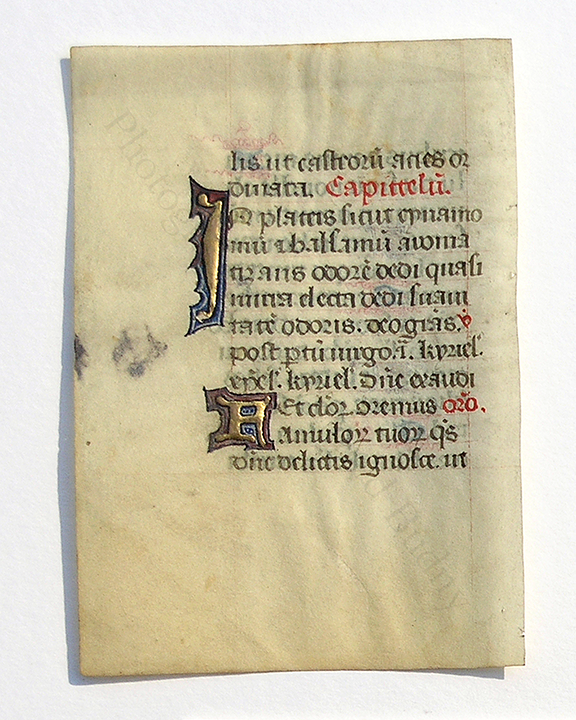 At present, the leaf measures circa 76 × 54 mm, with a written area of circa 40 × 36 mm. The single column of 12 lines is written in Latin in Gothic rotunda script, with embellishments. Although somewhat perfunctory in the execution, the embellishments and their colorful materials add an element of luxury. The embellishments include rubricated titles, in-line initials with pen-flourishes, and enlarged polychrome initials with ornamental frames. On the recto, the 1-line initials for sections beginning within the lines are alternately blue and gold respectively with red or purple penline extensions comprised mainly of undulating lines resembling pulled sugar ripples. 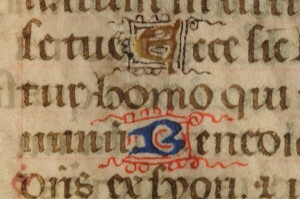 On the verso, the polychrome decorated initials either stand alongside the column on the verso (6-line-high I for In of the Capitulum, that is, ‘Reading’, from the Old Testament Book of Ecclesiasticus) or occupy a position inset within it (2-line-high F for Famulorum of the Oratio or ‘Prayer’). 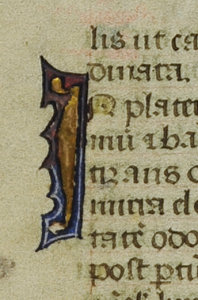 For these enlarged initials, the letter itself is rendered in gold leaf, with bulbous tips, against an asymmetrical background frame with toothed or cusped edges and extended tips. Each frame, filled with sections of rusty reddish and blue pigments, has an inset inner contour of white pigment. Within the F, the 2 enclosed counters above and below its tongue have a surcharged pattern of white dots. Prayer: Famulorum tuorum . . . ut [/ qui] . 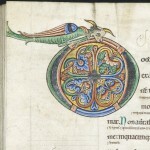 The text corresponds mostly to a portion of the Hours of the Virgin represented in a paragdigm online here (with an English translation), where the assigned location within the Hours (in that case, for the Use of Rome) is None, that is, the mid-afternoon prayer within the canonical periods for daily prayer. Expanding the abbreviations in the text, the transcription here of the Leaf provides points of orientation as well as indications of its divergences from the paragdigm. dinata. Capittlu[m] [sic; = Ecclesiasticus 24:19–20]. The next leaf would have picked up from there. Such a span of text occurs within various Books of Hours, and for various points within the Hours. The use of the Antiphon Pulchra es et decora filia Jerusalem terribilis ut castrorum acies ordinata is recorded in a variety of sources for several occasions within the liturgical year. 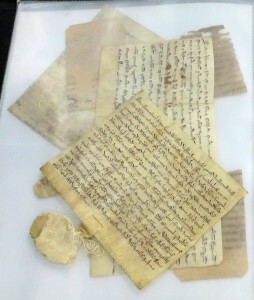 Therefore, without fuller knowledge about the other parts of the original manuscript and its specific approaches, it seems difficult to determine to which place within the Hours the portion represented by this leaf would have specifically corresponded. Without better evidence, we resist a temptation to assign this very reading in this specific manuscript to a particular part of the Office of the Virgin. 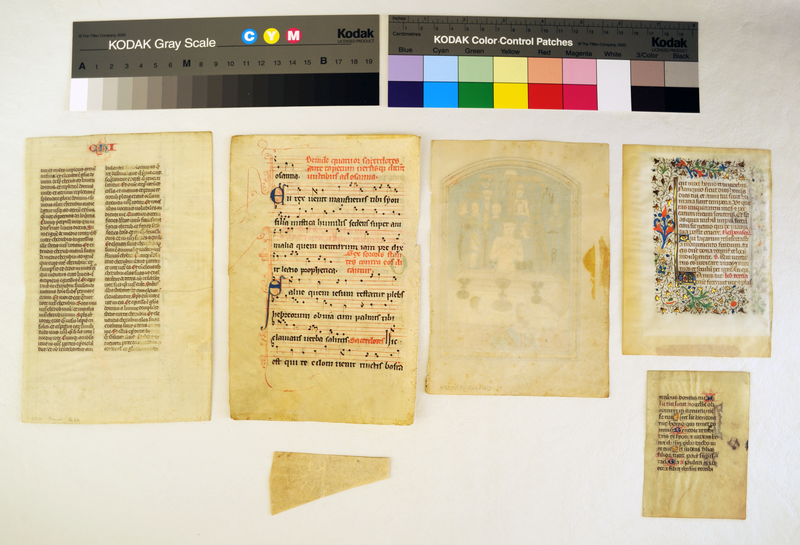 You may remember that some of our blogposts in the series on Manuscript Studies have identified fragments from manuscripts dispersed by Otto F. Ege (among others). So far, these have addressed ‘Ege Manuscripts’ 8, 14, 41, and 61. So the nature of his dispersals and the resources for identifying some of them have become familiar. You can find descriptions and references in those posts. Scott Gwara’s Handlist (2013) of ‘Manuscripts Collected or Sold by Otto F. Ege’ does not apparently include any volume which corresponds neatly to the characteristics of this leaf. We were hopeful. 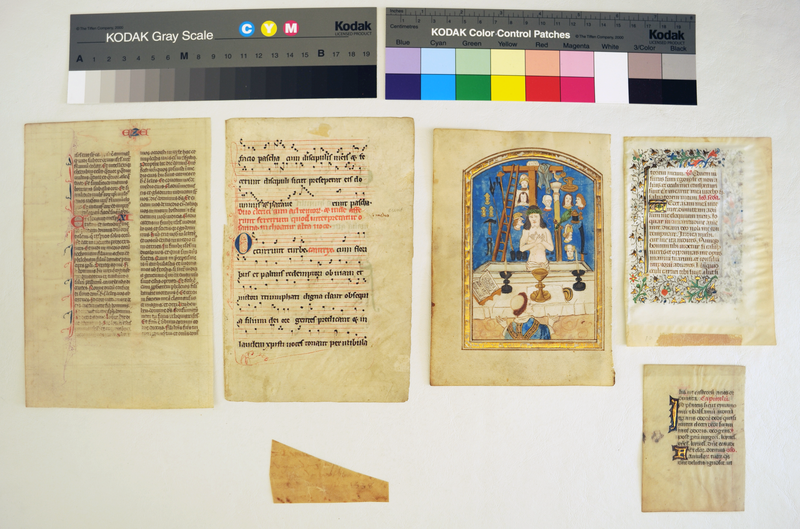 A somewhat similar manuscript, fragmented and dispersed, is represented in Ege’s Portfolio of Fifty Original Leaves from Medieval Manuscripts, Number 36, a mid-15th-century French Book of Hours with a (not identical) comparable style, layout, and decoration. But it has 13 lines per column, rather than the 12 on this Leaf, and includes some other approaches to decoration, such as interlace patterns and the use of double (rather than single) white outlines inside the frames for initials. Wish we knew. Suffice, perhaps, for now, to say that the rotunda script indicates an ‘Italianate’ element. 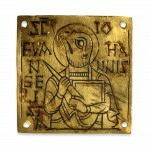 Not that this means that it is Italian script, or the work of an Italian scribe. Just an element, important to register. 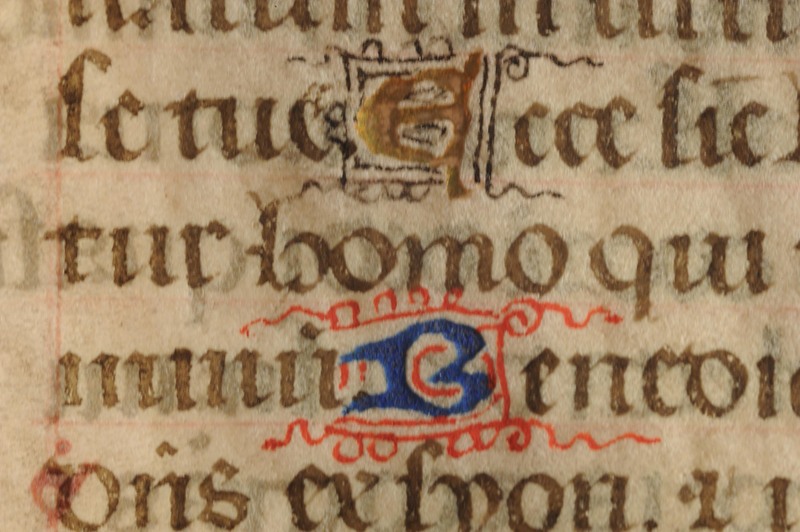 However, the style of the initials seems French instead. So, perhaps, this leaf and its original manuscript (if fully consistent) might have originated in Southern France, Italy, or (say) Spain, circa 1400 or later. The owner reports, in responses to questions repeated over years, that this leaf was acquired at an unknown date, unframed, and from an unremembered source. He confirms that the single-line inscription in ink on the envelope is his own handwriting. It was probably a gift, but not sufficiently memorable as such, unlike another leaf from a different Book of Hours (Handlist 12) acquired as a wedding present. It was presumably a gift, he observes, because its purchase is neither remembered nor recorded among the available papers. On a personal note. Usually I am reluctant to say such. Collectors Gonna Do Whatever. Right. They can. But this situation makes me wonder. I remember vividly, clearly, precisely, the gifts, and their circumstances, which ever I have received. When I see — of course, because I place them in view — any gift, you know, I smile with recognition of the person, place and time of presentation (by whatever means, near or far), and even I the recall of the light or sunlight of the reception. That is how I think, and remember. Sensitive Creature, that’s me. And so, this occasion with the necessity to encounter forgetfulness, amounting apparently to negligence or indifference (same difference), makes me wonder differently, and with increased appreciation, about the merits of Eastern habits of stamping materials in the stages of successive ownership and appreciation. It seems a method worth considering for Western Stuff. Seems more respectful. I aim to label gifts to me even more precisely than before. P. S. You hear that? I am the sort of person who appreciates gifts. Do you know of any other leaves from this tiny book? They could be anywhere. We thank the owner of the leaf for permission to photograph, research, and publish it. It is a pleasure also to record thanks to Adelaide Bennett, Gregory Clark, and James Marrow for their expert advice about the leaf. Next stop in our exploration of Manuscript and Document Studies. Still on the quest of Fragments and Their Contexts. 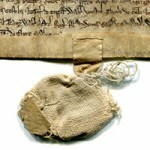 We turn now to a pair of documents in a private collection, reproduced by permission. They came for sale as a single batch, preserved together and sent forth together, apparently after centuries and generations with a common heritage. Their origin relates to Preston (now known as Preston Saint Mary), near Ipswich, in Suffolk in England.